Another parkrun PB, last minute race packs and new races. After the success of last week’s parkrun, I was doubtful I could improve today. To cut a long story short, I did improve, and have a new parkrun PB of 24:01. Such a nagging itch in the crotch that I was a mere 2 seconds from coming in under 24 minutes, but ho hum, maybe next time, right? I was also pretty happy to finish 5th female. Single figures is always pretty sweet (and there is simply no need to investigate and find out how many women actually participated – who needs to be brought down?). 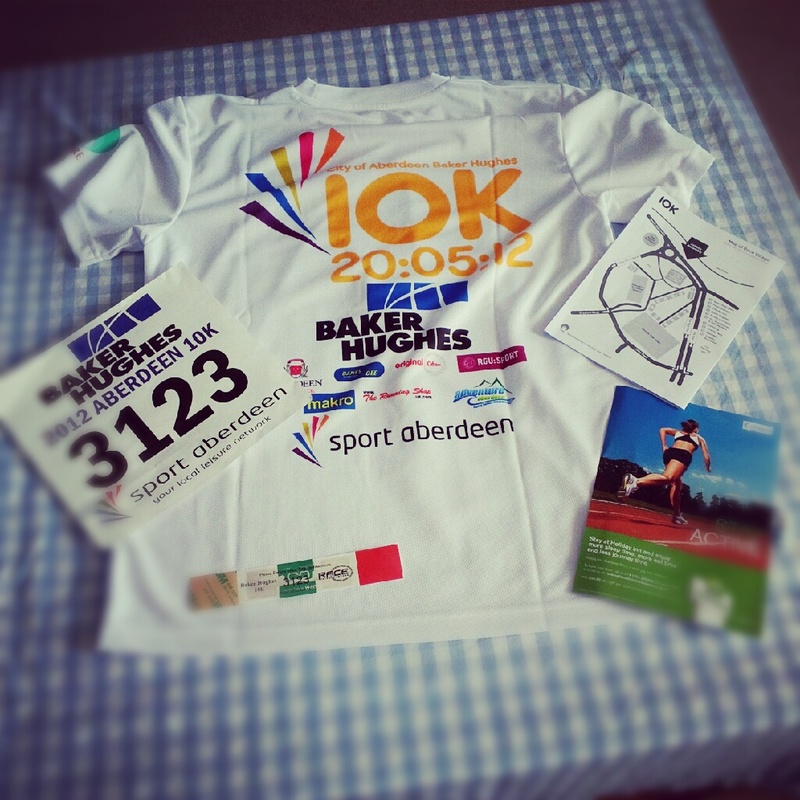 In other news, I finally got my race pack delivered for the Baker Hughes 10k here in Aberdeen next Sunday. There was a delay because they noticed, after sending out a few batches of race packs, that there was a spelling mistake on the bibs, so had to halt production, get new ones made, and then start resending stuff. It was a nice surprise to come home to after the gym and parkrun. I’m pleased that the technical tee is significantly less boring than ones in the past – they’ve used lots of colour! Nice easy number to remember! I was kind of thinking about running the 10k at half marathon pace, because I want to rock the Edinburgh half marathon the following weekend, but I know once I’m at the starting line, I’ll find it really difficult not to just hit the gas. I guess I’ll make my final decision when the starting gun goes! Finally, all these long runs on the weekend make me seriously dread my full marathon training that will need to kick into gear in July-ish. I can see myself getting really bored of them, without any atmosphere and all on my own. Solution? Search online for any long race that can be substituted as a ‘long run’ for motivation! So my marathon debut will be at Loch Ness in late September (the day after a friend’s wedding in Edinburgh, so I’ll have some magic to work there). Two weeks prior to this, I have entered the Crathes half marathon, and two weeks prior to the Crathes half marathon, I have blindly entered the BRG Challenge, a 17.5 mile hilly beast of a run up North. This entry was posted in 10k, aberdeen, parkrun, Running, Training and tagged 10k, 5k, aberdeen, baker hughes, Edinburgh, half marathon, parkrun, PB, running by MedalSlut. Bookmark the permalink. Congratulations on your 5th female placement! I can’t believe you have your first marathon the morning after a wedding. That might make for a very rough morning. I think so too. About 9 hours of the day before will be spent on a train. Need to collect my race pack the day before, travel to the wedding, then travel back. And that isn’t taking into account my drinking….